A jumping simulator versus the real deal: How does it measure up? Tension levels rise as riders head out into the jumping arena, but can a simulator replicate that buzz? Research carried out in Austria measured several physiological parameters in 12 riders around a real jumps course and then on a simulator. Their findings? The riders appeared to have some nervousness in tackling the simulator, they noted, saying it certainly evoked a sympathetic nervous response. However, it was not as physically demanding as the real deal. Natascha Ille and her colleagues noted that equestrian riding simulators were now available for dressage, jumping, polo or racing. They set out to compare salivary cortisol levels, which are an indicator of stress, as well as heart rate and heart-rate variability in the 12 riders around the challenges of a real riding course, as well as the simulator. They found that salivary cortisol concentrations, which were measured from an hour before to an hour after simulator training, were higher than during training with a horse, but did not change acutely with the simulated or real showjumping efforts. “This indicates that the novel situation of simulator training was perceived as more stressful than routine training with a horse,” they reported in the Journal of Equine Veterinary Science. The heart rate of the riders increased both on a horse and on a simulator, but reached significantly higher values on the horse. Heart-rate variability decreased during both the simulated course and on a horse. 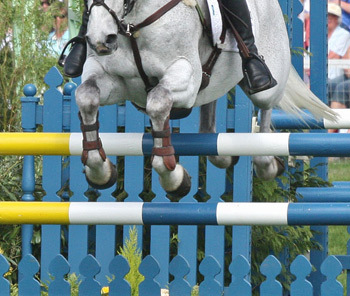 “From 30 minutes before to 30 minutes after the jumping tests, heart-rate variability was more pronounced in association with the simulated course versus the course jumped with a horse. “The changes in heart rate indicate that simulator training required less physical effort than training on a horse. “Based on differences in heart-rate variability, training with a horse was associated with a more pronounced sympathetic tone than simulator training,” they wrote. “Although simulator training in principle mirrored the situation on a horse, the demands on a horse were more complex,” they concluded. The research was carried out by Natascha Ille, Mareike von Lewinski, Christine Aurich, Regina Erber, Manuela Wulf, Rupert Palme, and Jörg Aurich, all from the University of Veterinary Medicine in Vienna; and Bill Greenwood, of Racewood Ltd, in Tarporley, Britain. Riding simulator training induces a lower sympathetic response in riders than training with horses. Natascha Ille, Mareike von Lewinski, Christine Aurich, Regina Erber, Manuela Wulf, Rupert Palme, Bill Greenwood, Jörg Aurich.